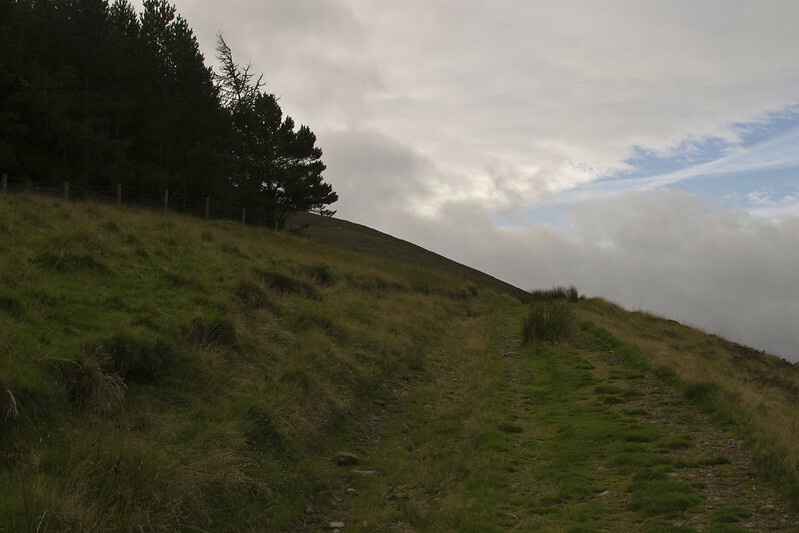 Ever since I moved further out into South Lanarkshire I've been looking at walking Culter Fell (pronounced Cooter). 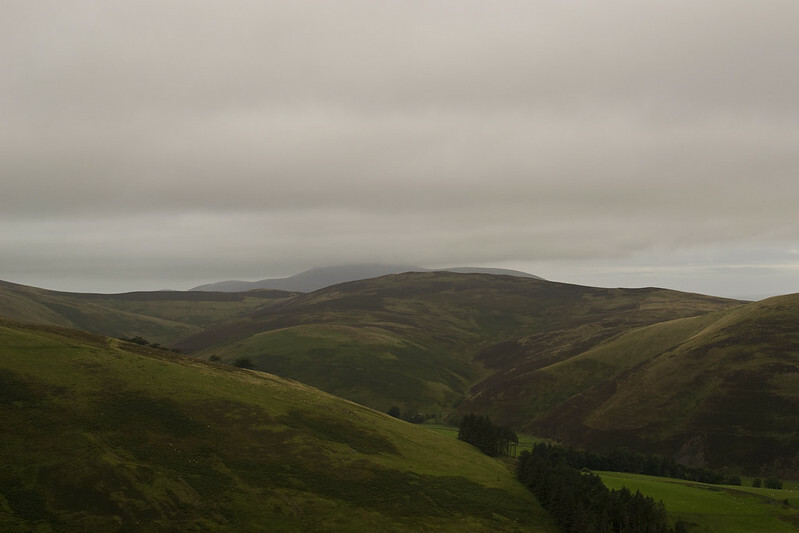 I kept going to the circular route that's on the walkhighlands website and also another walker that blogs, James Boulter (@bpackingbongos) posted a walk that he had done recently on Culter Fell. That really made me want to get out and do it. For the list tickers, Culter Fell sits on 3 list. It's a Marilyn, Graham and a Donald. 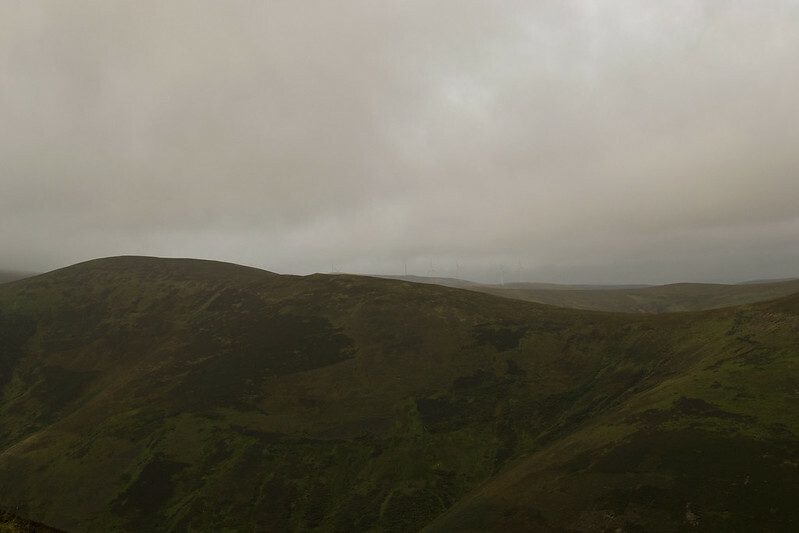 It's the highest point it South Lanarkshire at 748 metres or 2244 of good Scot's feet so that should make for a good view. 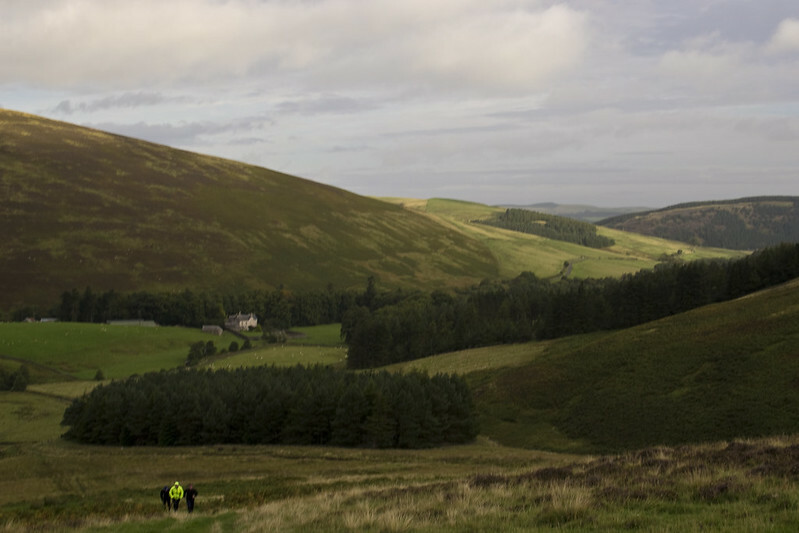 It is also part of the Southern Uplands. What's not to like. An opportunity presented itself so with the blessing of my wife I was off early Saturday morning. I set the alarm for 0630 ZULU. Up and out the door before the house wakes up. My bag was at the door ready and packed. The only thing I didn't have was a map of the area. I had a thought to stop at the motorway services at Abington and pop into the WH Smiths and pick one up. Off I went chucking everything in the car and joined the M74 at the 'gow. I doesn't take long to get to the Abington junction from Blackwood. I was at the services before I really had time to think. Parking up I wasn't very impressed with sky, clouds hanging low and heavy but it was breezy and the clouds were moving fast. I was hopeful for clear skies and good vistas. The service station was busy even at this early hour and with half the concessions were closed at that. I made my way through to the WH Smiths and their books/map section. After scanning the shelf a few times it was becoming pretty clear that they didn't have the map I was after, the Ordnance Survey Explorer 336, Biggar & Broughton, Culter Fell & Dollar Law or even the Landranger 72, Upper Clyde Valley would have done. 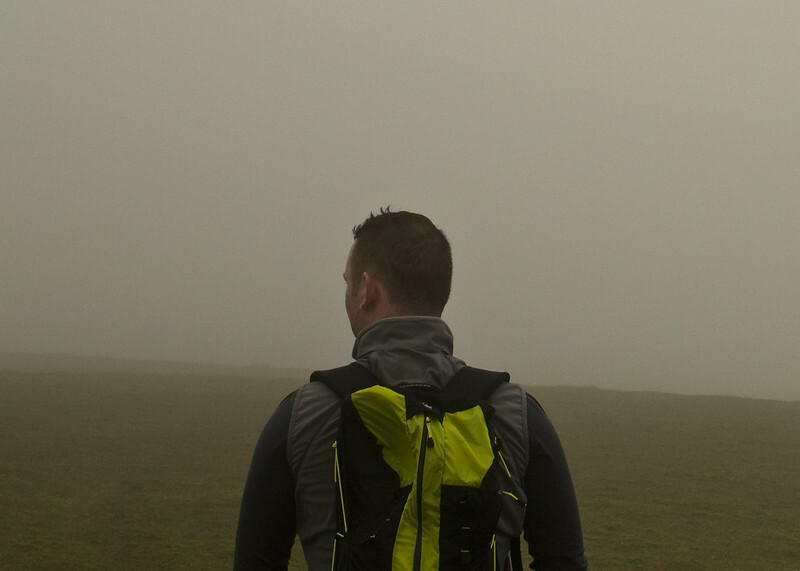 I think I could have had any map for the rest of Scotland and the Lake District that morning. A little put off but unperturbed. I've got OS maps for all of southern Scotland on my iPhone. It's just nice to have a back up. Since I was at the services I grabbed myself a roll and sausage. It would have been not to. Extra Fuel for the engine. After stuffing my face and costing myself a small fortune in the process. 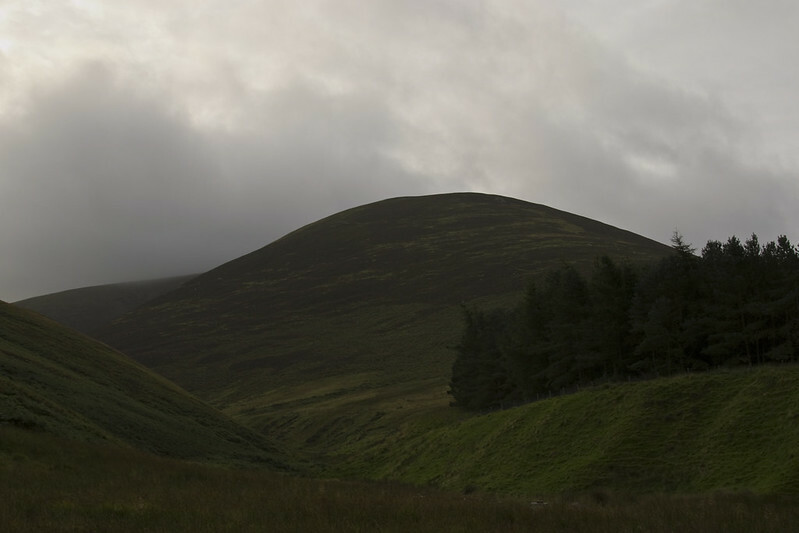 I jumped back in the motor and headed along the road towards Biggar. A map is cheaper than a meal at a service station. The village of Coulter is only a few short miles along the A702, parts of which apparently follow the route of a Roman road. I drove into Coulter and turned right where the 702 turns left at about 90 degrees and heads for Biggar. There's a small junction on the corner. This road takes you past the new primary school and out towards the reservoir. The road is marked as a dead-end but it's a few miles before you need worry about that. I followed the single track always mindful of other cars driving towards me especially around some of those twisty bends. However it wasn't cars I needed to be worried about but sheep. A few yowes had squeezed under a fence or through a hole hugging the banks next to the road and getting skittish as I approached. Always makes for fun driving trying not to play dodgems with the yowes. Don't think the fermer would be happy. I continued along the single track road until it forked at Birthwood and Culter Allers Farm just before the public road ends. I swung the car around as the road was wide enough. I was now facing back the way I came. Just in case I need to make a quick getaway. 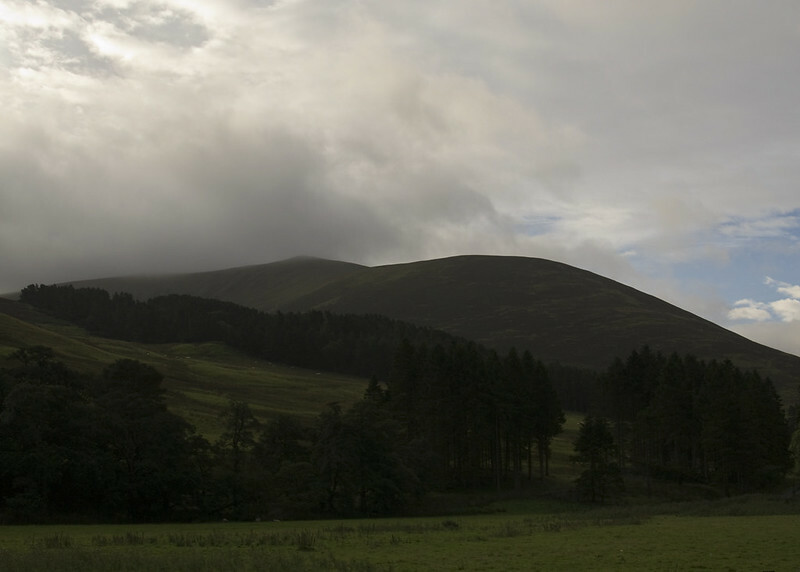 Getting out the car I looked up towards Culter Fell, only not to see it as it was covered in cloud. I was there so there was nothing left to do but get on with it, in the hope the cloud would clear. I grabbed my new hand made wooden walking stick. My dad makes walking sticks of all styles, types of wood, horn and antler handles. I opted for a plain stick that felt good in my hand and light with a vee notch at the top. I swung the rucksack on and headed off along the road. As I went I set up ViewRanger on the phone to record my track so I could upload it later. Airplane mode and locking the SIM to save the battery and only use the GPS. I stuck the phone in my pocket. I crossed a cattle grid and the road started to climb slightly. I was on the look out for a small burn that the road crosses as after that the path I was to take started on the left. As I wandered along the road looking for the path taking in the glen, I heard the cattle grid rumble and rattle with what sounded like a quad bike coming my way. I waited until the noise of the diesel engine got closer and stepped off the road and turned to see a JCB Workmax with the fermer and his sheepdug in the passenger seat rather than the quad bike I had suspected. We exchanged a couple of nods and a wave has he drove away. There was no need to worry about spotting the path as it's pretty obvious where it starts. It starts off nice and gentle before it picks up a mean gradient. It's a very clear track to follow up Fell Shin and you soon pick up some great height and the views down the glen back towards Coulter are great. From here though the reservoir is hidden. Views above 600m still weren't looking good with all the cloud but the wind was still brisk and the clouds were moving fast. I still had some hope of clear tops. I was fascinated by some really old ancient looking stone structures almost kist like in their construction minus the coping stone. Such wonders these are as the followed the path up the hill. Amazing, what was their significances? Who built them? Bronze age, Iron Age? It was also amazing that in some places due to the lee of the land or the way the wind was blowing all of a sudden I would walk into a small pocket of calm. Maybe only for a couple of steps but it was like walking through a door into another room. All of sudden silence and then you would pick up the sound of birds singing and the grouse calling. No wind whistling. I found myself stopping and listening every time I stepped into one of theses areas. I turned back to look down the line of the fank like things and noticed some crazies. Hill runners, crazies to me. Why would you want to waste a perfectly good hill walk by running. Not me. It didn't take long from the to catch me. I was taking my time and enjoying the walk. As they got closer, I moved out their road on the track to let them pass. We said our mornings. I asked is this a regular thing for them, the answer was yes. Crazies. The one at the back walked with me for a bit, talking. I think he was trying to get his second wind. I asked what route they were taking and what I had hoped to do. Weather permitting. The 3 of them run these hills most weekends. See crazies. The route is a good one and the views great on a clear day. Here's hoping I said, with that he picked up his pace and went to catch the other 2 crazies, I mean his 2 buddies. It wasn't long before the 3 of them were out of sight and over the top of Fell Shin. Once gone I got back to my structures. Was it coincidence that pockets where the wind dropped was round most of these stones I wondered. It wasn't till I got home that I found out there was nothing magical about them. Just some old unloved grouse butts. Obvious now looking back. Jeezoh, I got carried away with myself. The wind had gone from breezy to a severe buffeting. Nothing drastic, 3 pints of the stellar tortoise on an empty stomach as I crested Fell Shin and up on to Culter Fell properly. There's a single solitary wooden post here just off to the left of the path. It's purpose is definitely a mystery to me. One for Scooby Doo and his mystery bus. I took a walk over to check it out and to my surprise a pair of glasses were hanging from it and for a while by the nick they were in Well weathered. Some poor soul had lost their reading glasses and some good soul had stuck them on the post to be found. 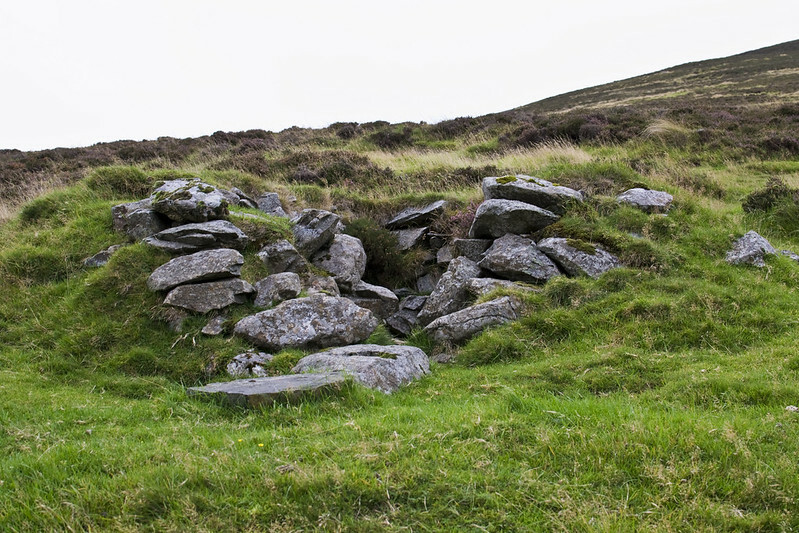 From there I headed over to a small marker cairn. Here the clouds were drifting across the front of me and up ahead the track was disappearing into some heavy clouds and no views. 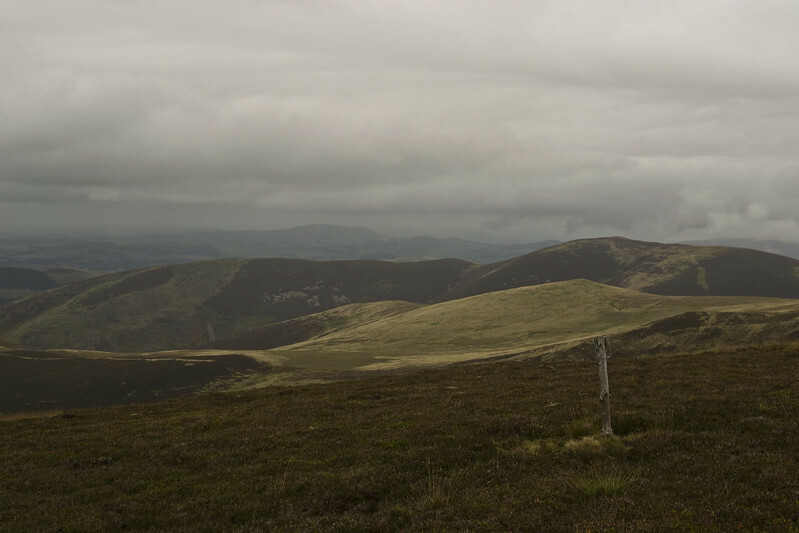 If I turned my back on the clouds I had good views over to Tinto and the hills otherside the glen, Dod Hill and Hillshaw Head above the reservoir. Luckily the clouds were hiding the majority of the large turbines over there. The closer ones keeked in and out of the drifts. There was some pluses to all the cloud. 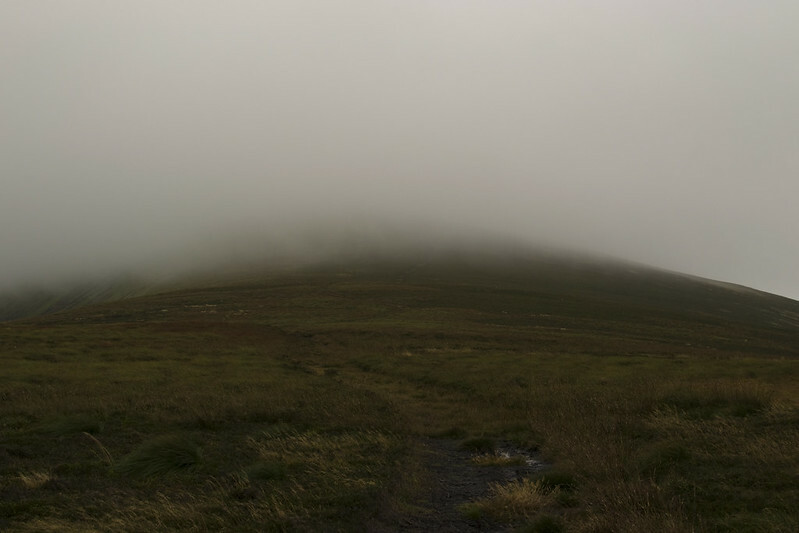 I turned around and head off in the direction of the cloud and the top of Culter Fell or so I hoped. I decided that it would be a good idea to get the phone out hand have a check. I'm really glad I did. The battery was hovering on 21% and I hadn't even been out for more than a couple of hours. I can only assume that ViewRanger and iOS7 don't get on very well or it's how I have my settings in ViewRanger pinging away. This wasn't going to end well. No paper map and phone not long from flat and me somewhere I had never walked before. Decisions were going to have to be made. Go on or go home. I knew I wasn't too far from the summit. I could see that from the screen on the iPhone. As the 20% battery warning popped up. I took out my compass and took a bearing. You can't beat the Silva 1-2-3 style of navigation. Get me doing a bit of proper navigating. Kind of. Compass in hand a followed the path towards the cloud and hoped for the best and the path would hold true. Worse case I would just turn round and head back the way I came. No blood, no foul. In the cloud I had the feeling of the distance expanding but my view contracting, almost like time was standing still. Gone were the birds and grouse. Just myself and me with the wind ringing in my lugs. As the steepness levels out here to a gentle incline towards the summit of Culter Fell, the ground is no longer hard but wet and boggy mire. Lots of standing water and a faint track that was flitting in and out. Check the compass, check the path or check the compass and hold to the reading and hope to pick the track up. This really slowed down the last few hundred metres. Felt like I had walked an extra mile, the time it had taken. 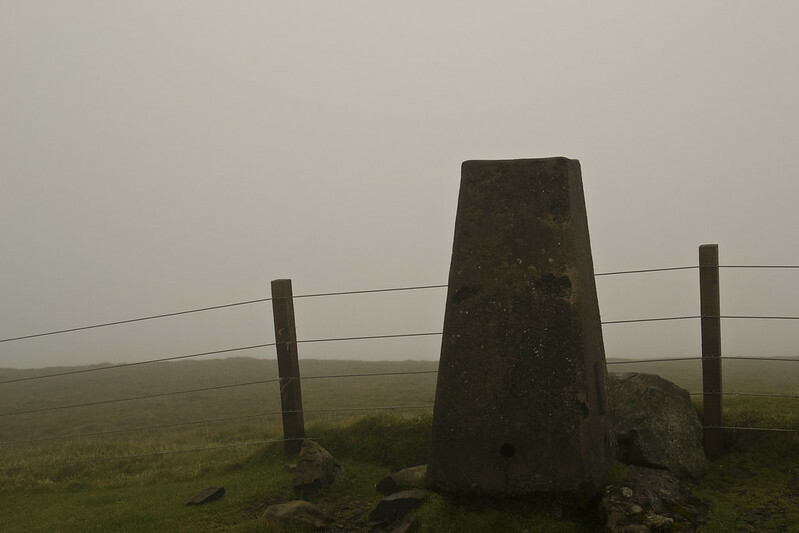 Eventually the trig point and the summit top of Culter Fell started to solidify out of the cloud. My compass reading had been good and the path had stayed true most of the way. Had I missed the pillar I would have walked into a fence. Let the wind blow high Let the wind blow low Through the hills In my kilt, I'll go All the grouse say chut, chut, chutttttt Tookie, where's your troosers? I wasn't even wearing a kilt. Plenty of grouse shouting on the lower slopes though. I'm a bit daft in the heid at times. Chanting away to myself it was long before I was back down below the cloud and the world opened back up to me no longer enveloped in cotton wool, enjoying the pockets of quiet on the way down as I had on the way up. After sauntering around for a bit I was back on the road and in the car heading for home.